Hailing from Alberta’s Peace Country, this Métis singer/songwriter has all the voice, musical chops and stories from the road that anyone could ever want. Her records include An EP (2011) and Everything and Nothing At All (2017.) 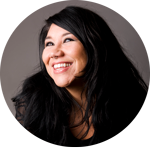 The latter earned her the Indigenous Artist of the Year Award at the Western Canadian Music Awards, an Indigenous Music Award nomination for Best Pop Album and eight nominations for the Edmonton Music Awards, for which she won Female Artist of the Year and Indigenous Recording of the Year. She was also a nominee for the 2018 CBC Indigenous Music Awards for Best Pop Album. She has toured all over North America and into Europe promoting her album. On her shows, Celeigh shares true stories from her life on the road, along with music from all the people she’s met along the way. Celeigh’s hidden superpowers include her single-parenting abilities (she has a teenager,) and her skill in holding a note for a really long time.